Welcome to part 2 of 3 of this tutorial series. 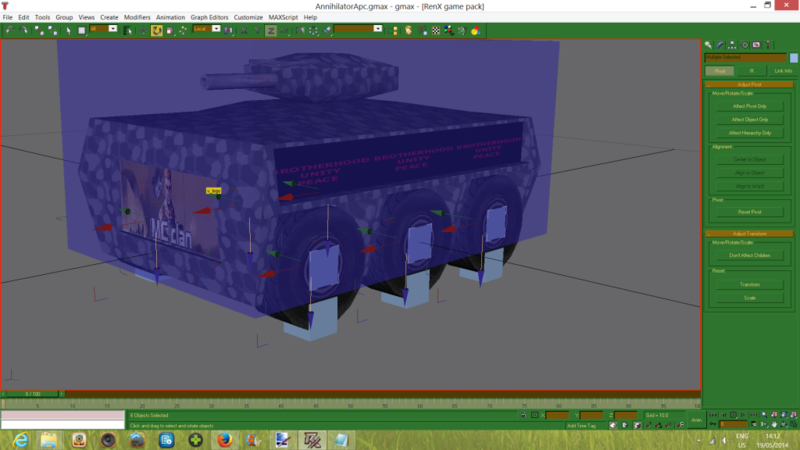 In the previous part we modeled a vehicle, in this one we will bone it and in the final part we will set it up for multiple turrets. 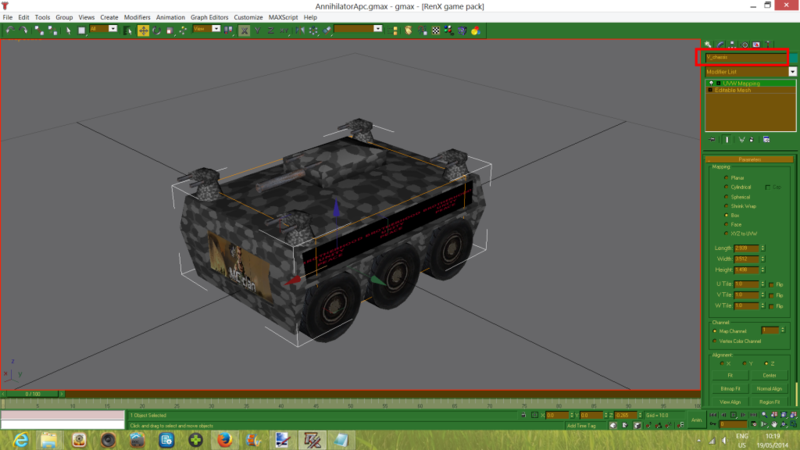 Obviously, I will be using the vehicle model i made in part 1 of this tutorial series. It might be handy to read his 'reference' section at the top so that you know what our bones do (his explanation is more elaborate than the brief ones I provide during this tutorial). You will need RenX and LE for this tutorial. First we will combine our vehicle parts. I have already told how to do this in the modelling tutorial, but to briefly recap: convert one object to an editable mesh (right click convert -> convert to editable mesh) then make sure you keep that selected, click the attach button and click on any object(s) that need attaching. 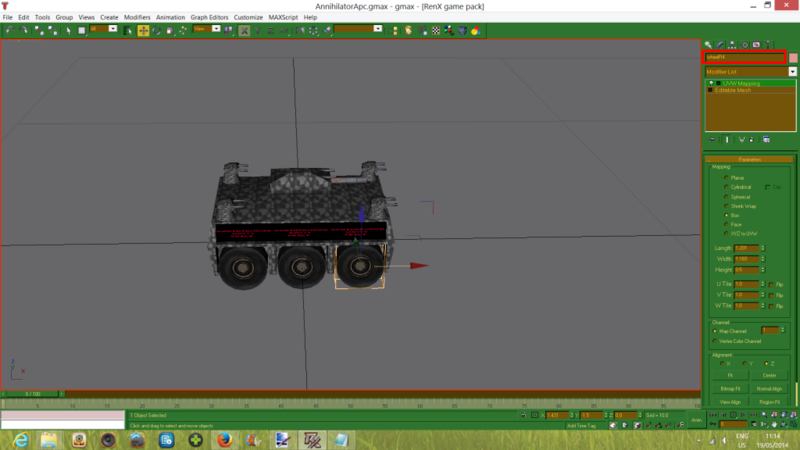 Let us start with the chassis, as it already an editable mesh. We do not need to attach anything in my model, but if your model has a chassis made up of several parts, you will have to attach all parts that make up your chassis. You could attach the image panels we made on the sides and front and rear earlier, but doing so will probably make them look ugly (try it out if you wish, be sure to undo the change afterwards). This means we do not have to attach anything to our chassis, so we will only rename it. Select your chassis and go to the modify tab. At the top of this tab you can change the name. 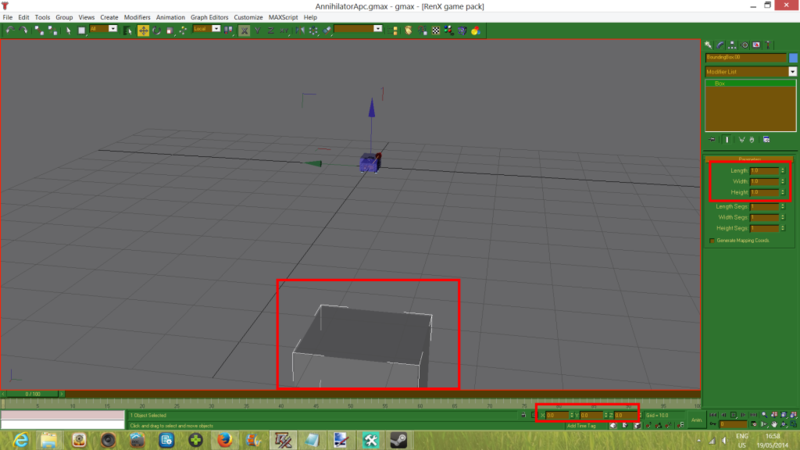 As you can see on the first screenie below it is called box01 right now. Rename it to "V_chassis". 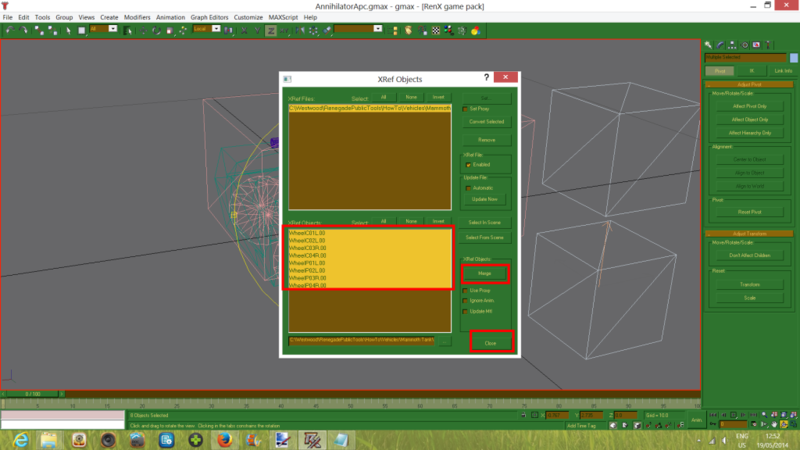 I am unsure as to how exact the geometry names have to be, but you might want to just copy paste the names from the tutorial, since those do work. 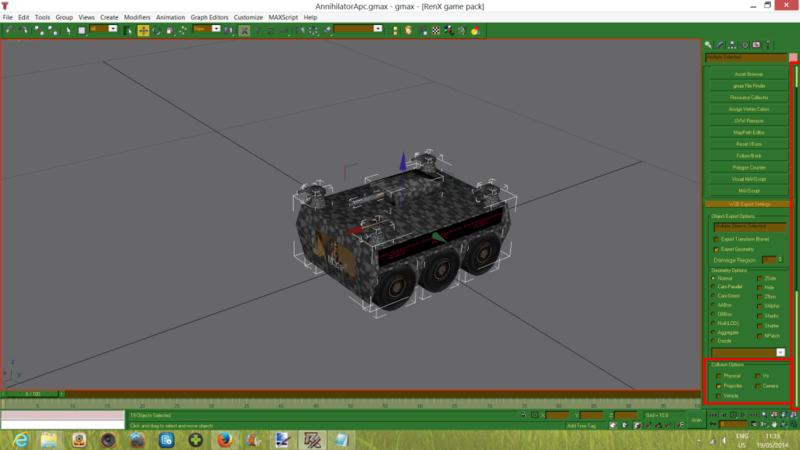 Next we will do the turret. We will be adding the secondary barrels to this. First select each secondary barrel and convert them to editable mesh. Enable wireframe mode (F3) so you can see the little blockers inside. Click attach and click on the little blockers. 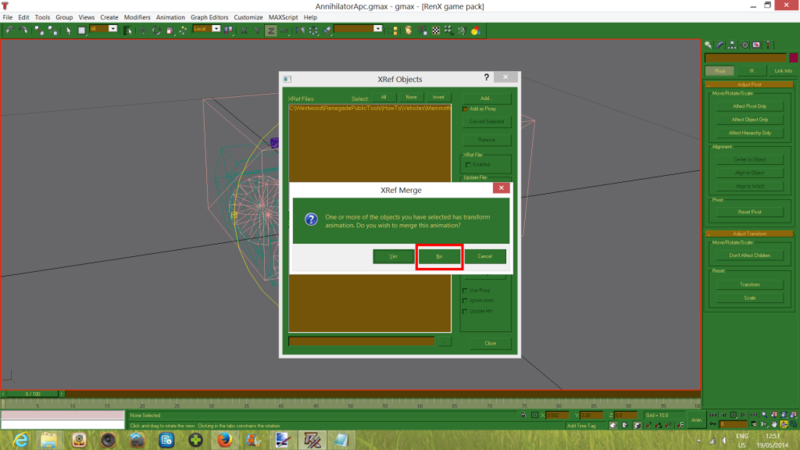 You will not get the pop-up menu this time because the blockers were not textured. Instead these are instantly textured the same as the barrel. Do the same for the other one. Now select the turret. 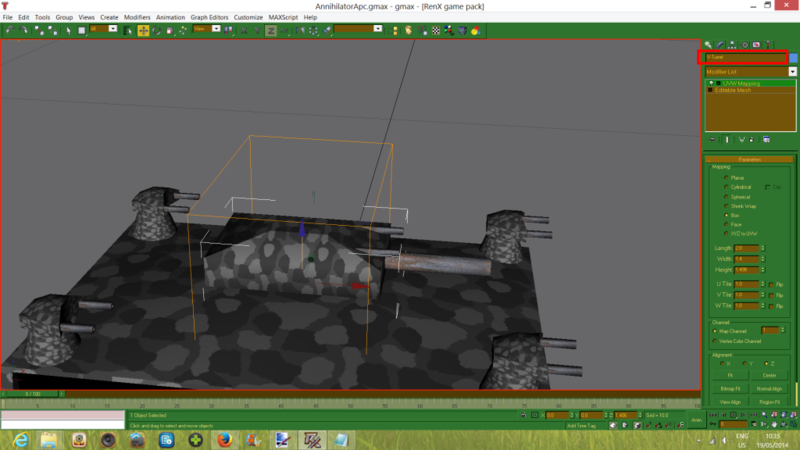 This one already is editable mesh. Click attach and select one of the secondary barrels. Then do the same for the other one. The pop-up will show here since both objects are textured. 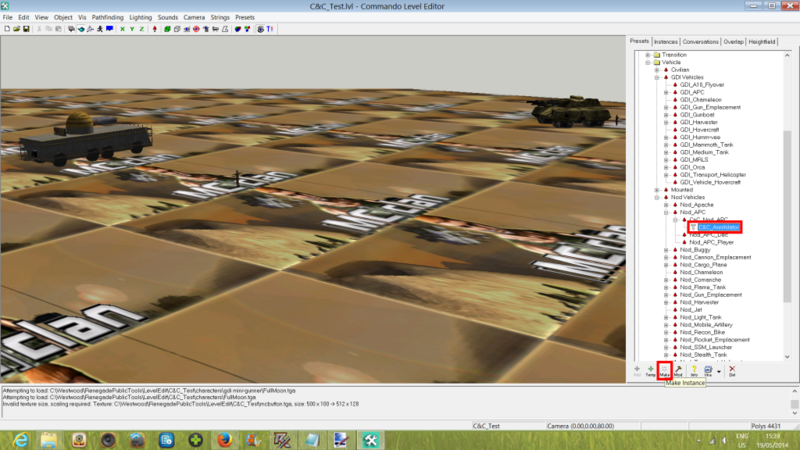 After attaching you might want to adjust your UVW map modifier depending on how the result looks. As you can see I adjusted two values to keep the fake barrels looking good. Now rename the turret to "V-Turret". 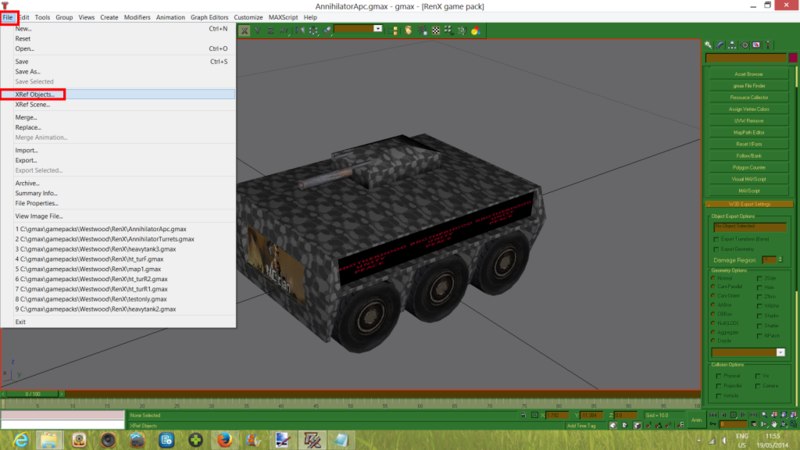 Next select the main ('real') barrel and convert it to editable mesh. 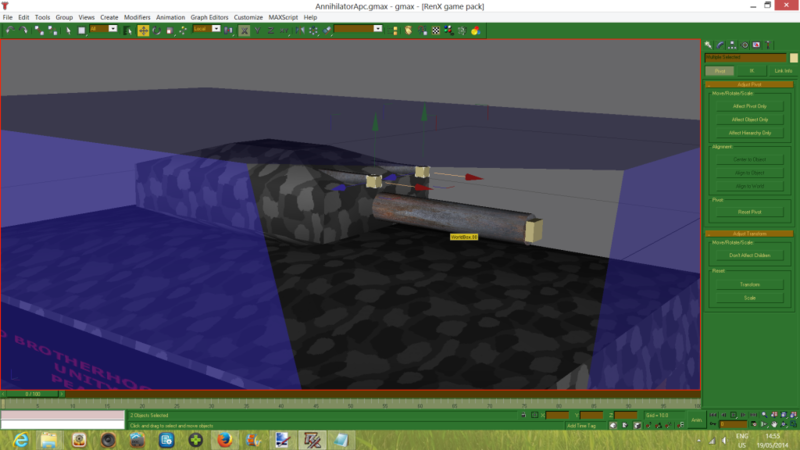 Click attach and click on the little blocker inside the barrel, while in wireframe mode. You might want to re-apply the UVW map modifier in this case since the small blocker inside will look ugly otherwise. Next rename it to "V_barrels" (yes, even if it is only one). If you have two barrels for your main gun, attach them together and name it "V_barrels" also. 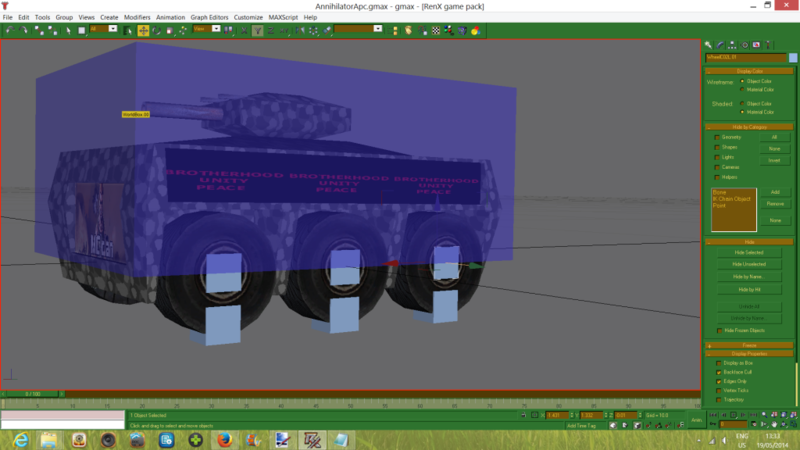 Next I adjusted the chassis's UVW map modifier length and width to match that of the turret to keep it looking the way I wanted to (this is purely asthetic though). Next click on the front logo, which is already editable mesh in my case, if it is not for you make it editable mesh first. Then click attach and click on the rear 'logo'. Rename the result to 'v_logo'. Now do the same for the side logos, but rename these 'v_logoN'. N is for Nod. 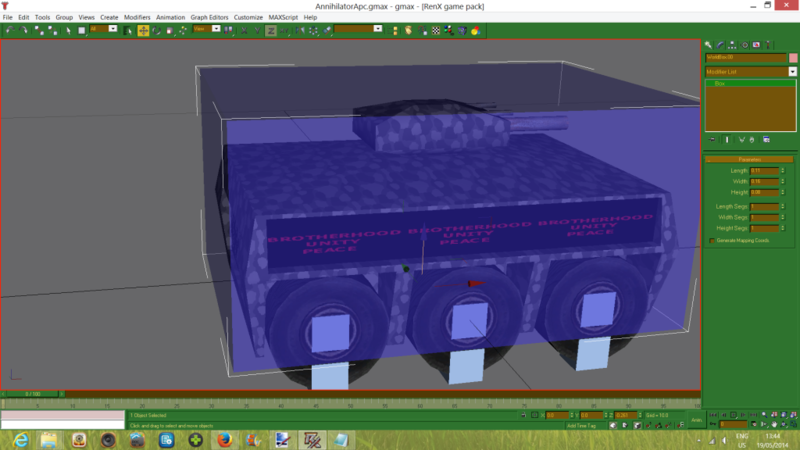 Next we will be attaching parts of our additional turrets and renaming them also. Select one part of your additional turret (either the cone or the box in my case) and attach these together (convert to editable mesh first obviously). Rename it to "V-Turret". Then select each individual barrel and attach each to the small blocker inside first and then attach the two barrels together. Re-apply the UVW map modifier if you deem it necessary. Then rename it 'V_barrels'. Repeat for the other additional turrets. Now to rename the wheels. First, the TRACKED vehicle wheel naming. LEFT) 'wheelR4', 'wheelR5' and 'wheelR6'. Do NOT name them R1, R2 and R3 when you already have an L1,L2 and L3. Although I doubt it really matters for the actual physical model, we will be naming our bones similar to the wheel so we can tell which go together and you CAN NOT name the BONES this way. The numbers have to keep ascending EVEN IF you switch from one side of the vehicle to the other (hence L1,L2,L3 and THEN R4,R5,R6). 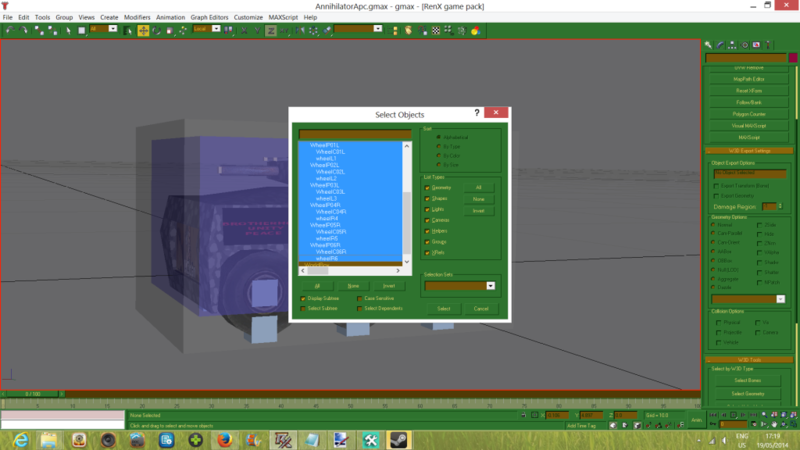 As you can see on the bottom screenie below, all my objects have now been renamed. To bring up this menu either click on the indicated button in the toolbar, or just press 'h' on your keyboard. I have only brought up this menu to check if I forgot to name something. If you did not forget anything, close the window again. Now, for your WHEELED vehicle just name your wheels wheel01 (front), wheel02 (middle), wheel03 (back) and on the other side wheel04 (front of vehicle), wheel05 (middle), wheel06 (back). 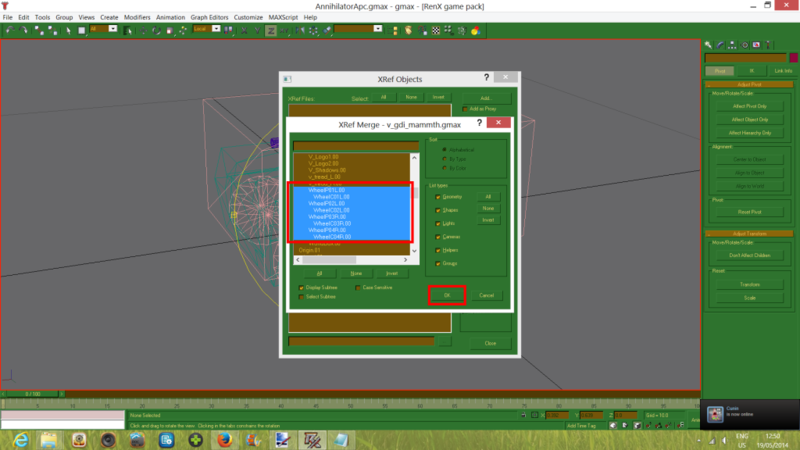 Next, select all objects on your gmax scene and go to the utility tab. Click on w3d Tools. Deselect Export transform (bone) and make sure export geometry is selected. Make sure in the geometry options that the only one selected is Normal. 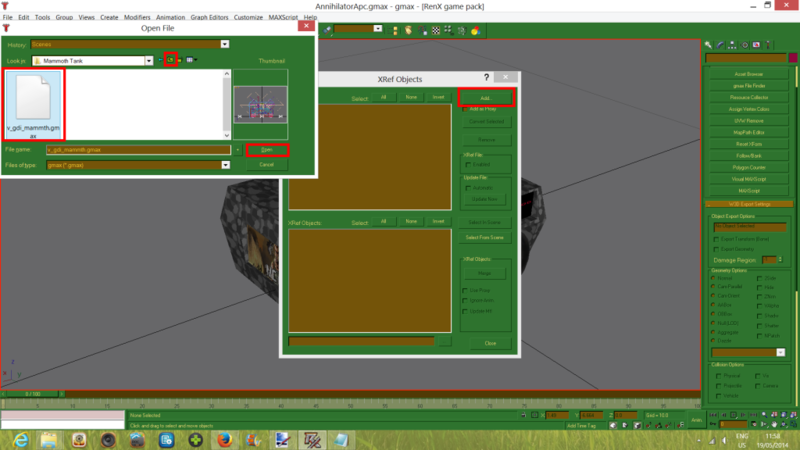 Now scroll down a little to the collision options. Check projectile and NOTHING else. 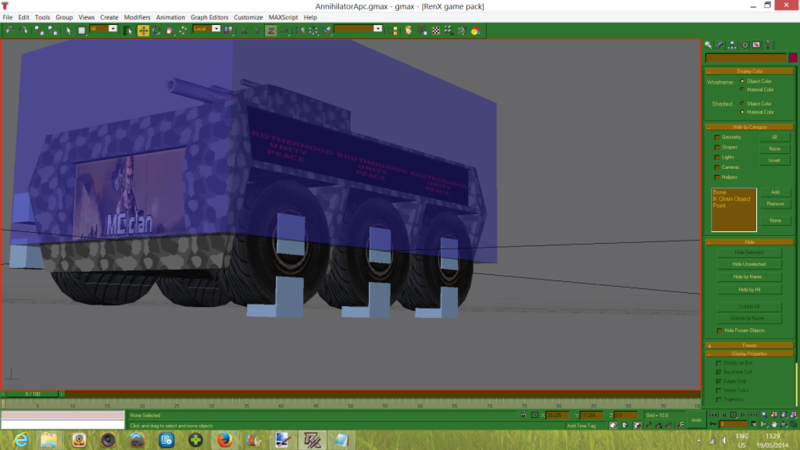 This makes your vehicle geometry able to be shot (you will see projectile effects if you setup your texture settings like I told you). If you are not making additional turrets skip the paragraph below. Now hit Save to save your new changes in this scene and then click Save as. 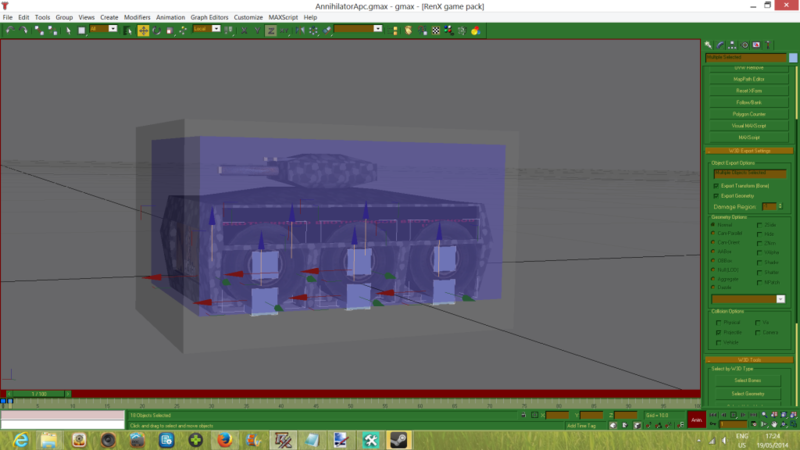 Name the new scene with your tank name, but with _Turrets or Turret attached behind it to indicate it is not the vehicle itsself. Now delete everything that is NOT the additional turrets and save the scene again. 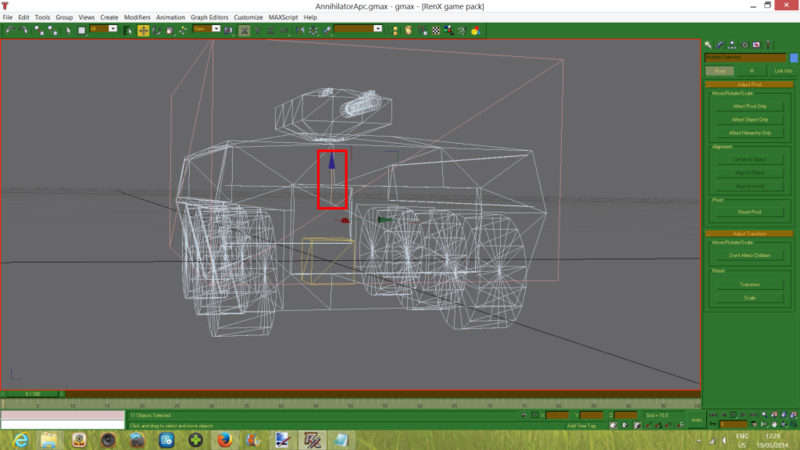 Now open your vehicle scene again and here delete the additional turrets. 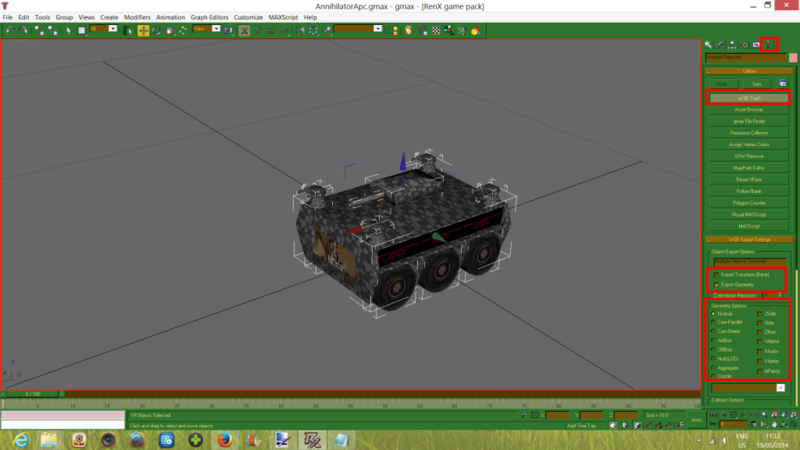 We are doing this because the additional turrets need to be a seperate model (or models, if you have made different turret models rather than just the one I made). Now you should see the origin and worldbox under Xref Objects. 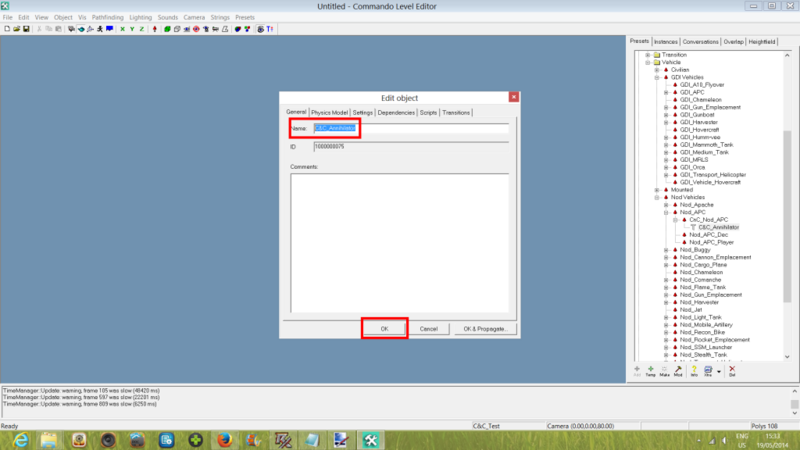 Select both again and click Merge. A confirmation pop-up will show up. Click OK. 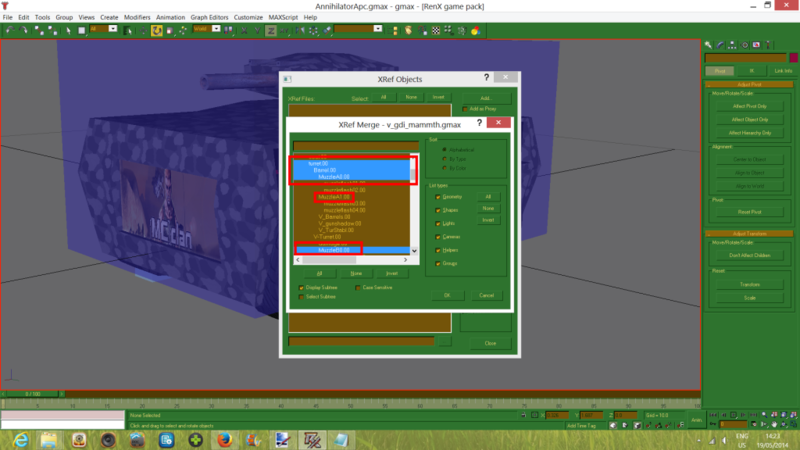 The worldbox and origin are now in your scene. Click close on the xref window. 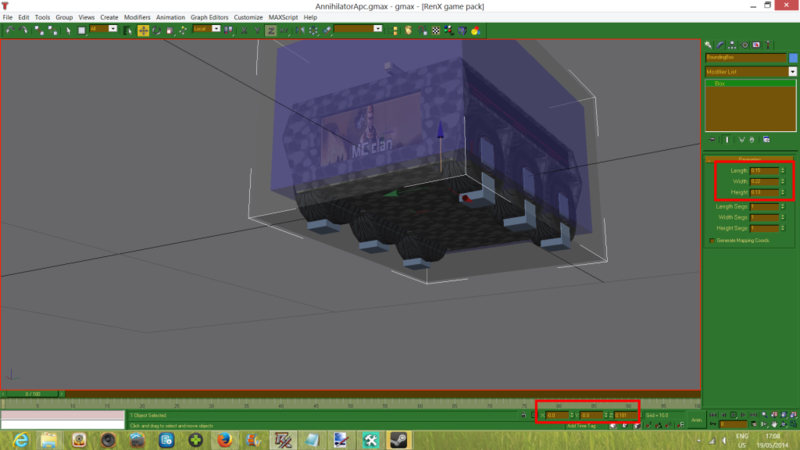 As you can see I have to zoom out quite a bit to see the worldbox. We will have to resize it. 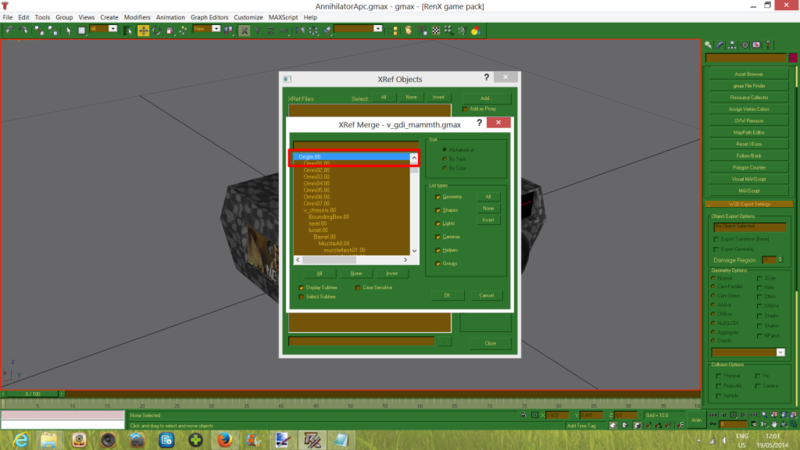 Go to the modifier tab and just edit the settings of the worldbox. 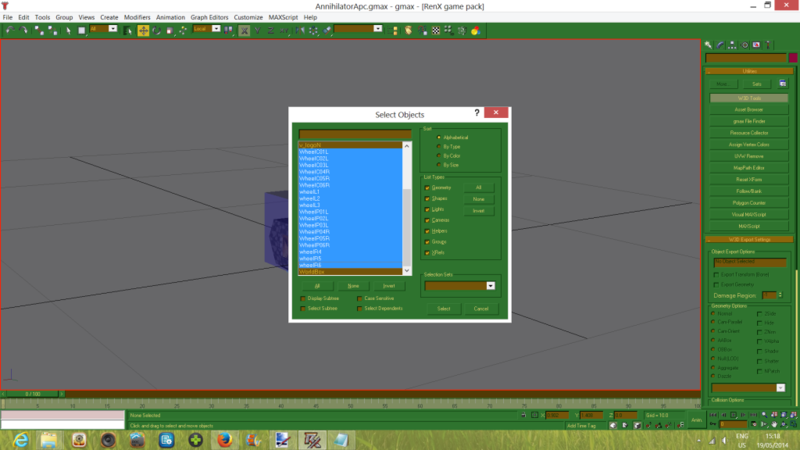 The values I ended up needing to resize it are below in a screenie. We might have to re-adjust the z value later on. 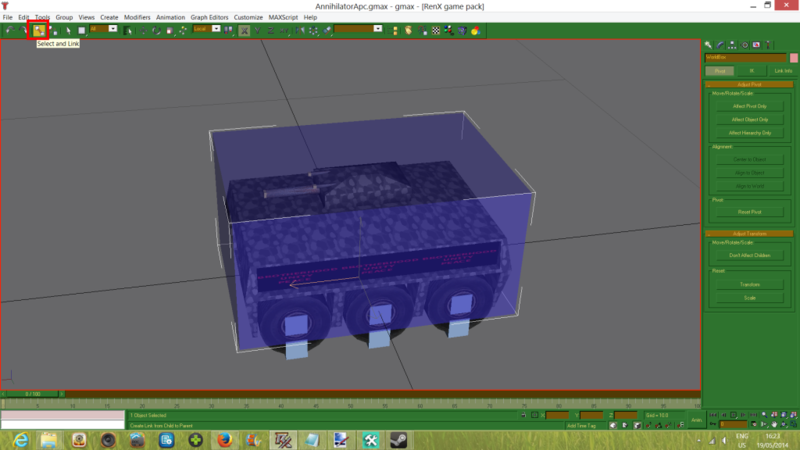 For now make sure the worldbox is on 0,0,0 and it fits the bulk of the body (of your vehicle). Just as a reference: the wheel center bones will have to be inside the worldbox, while still keeping the wheel P bones outside (wheel bones are next). But first also move the origin to 0,0,0. 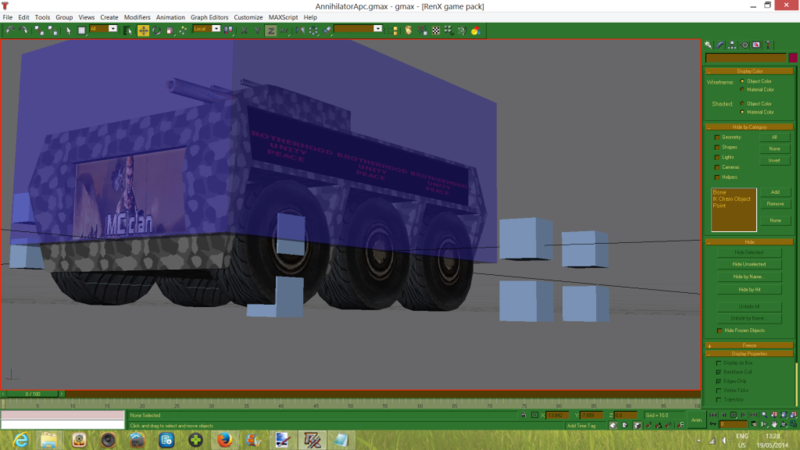 Wheras we can later move the worldbox up or down a bit to fit the vehicle, the origin HAS to be at 0,0,0. Resize the bone a bit if necesary; I did resize it a bit. 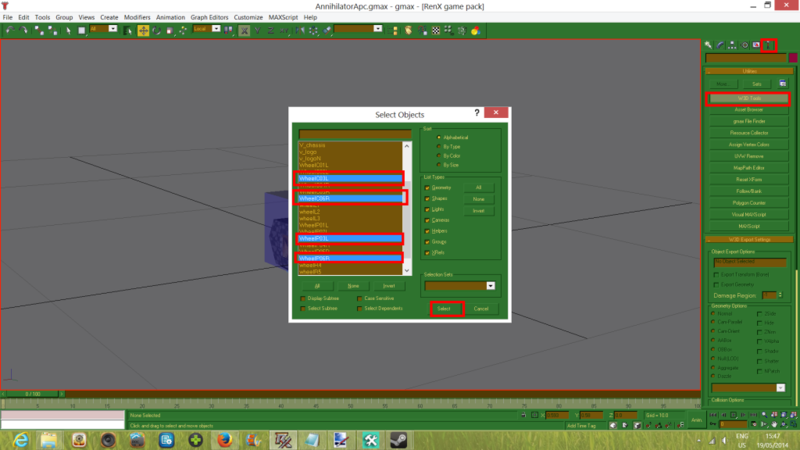 To select your origin either use wireframe (F3) and click on it or use the object list (press h) and select it. Now you can see the origin box is not neatly centered anymore. Click on the hierarchy tab. Click Affect pivot only and click on center to object. Click affect pivot only to unselect it. Now move the origin to 0,0,0 again. forward or backward and your vehicle might tip over. To far up or down and your vehicle might also tip over. 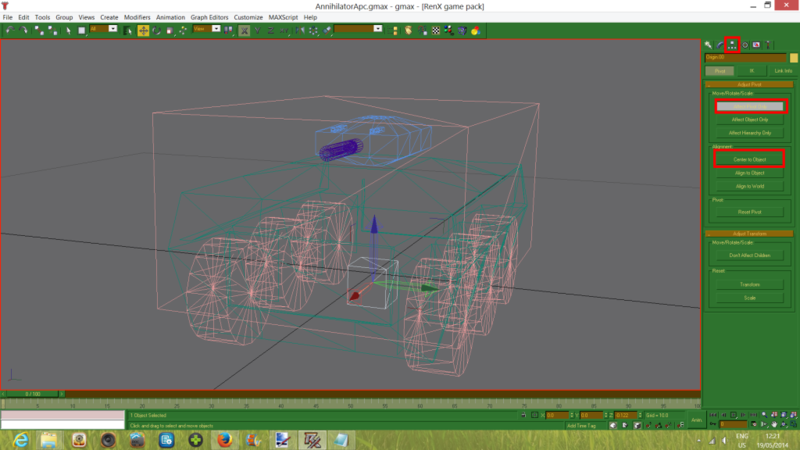 For this vehicle I will be aligning the origin up with the center of the wheels, for which I only have to drag down all geometry just a bit. Basicly what we are doing here is moving the vehicle around the origin to make sure the origin is roughly in the center (exactly in the center is the best). 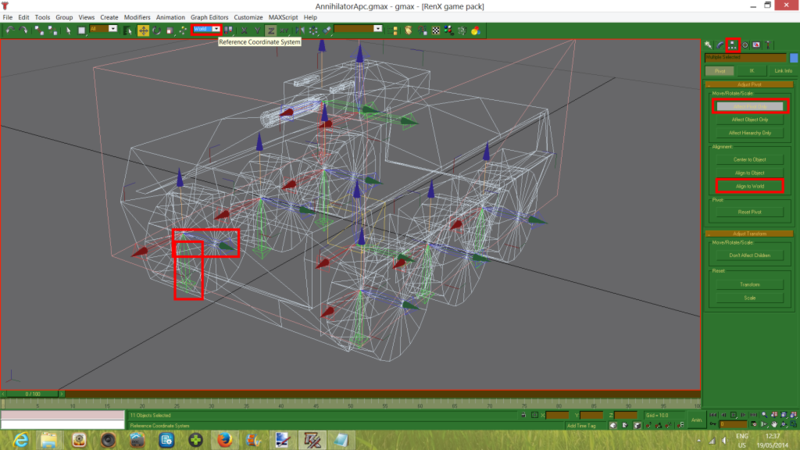 Now, while we still have all geometry selected, we are going to make sure eveything is aligned properly. 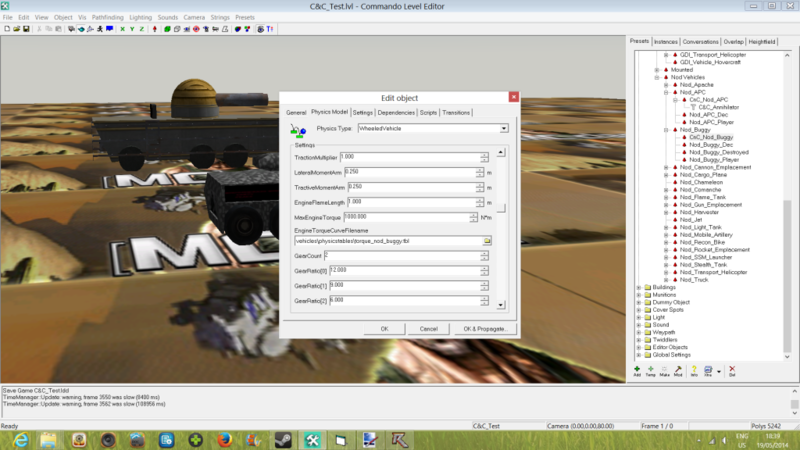 Go to the hierarchy tab again and click affect pivot only. As you can see with the wheels in my picture, they are not aligned properly. I am now on world view and the Y is pointing right. When I would switch to local it would be the downward green arrow which you can also see. You can change view form world to local at the top. You need to have everything aligned with the world. While still having all selected click the align to world button. If you now switch between local and world you will see they are now the same. 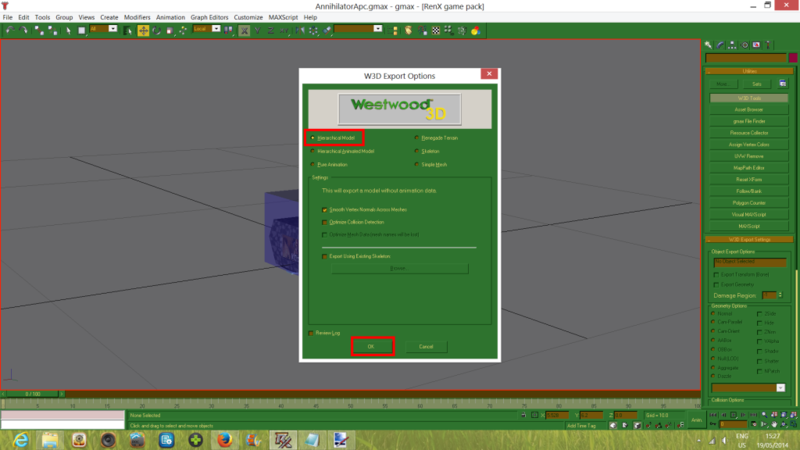 Next select your origin and worldbox and click align to world again. Now we will move on to the wheel bones, which imo are the easiest to get wrong. I will cover TRACKED and WHEELED again, when we come to naming them. We will be using Xref again, just like before. 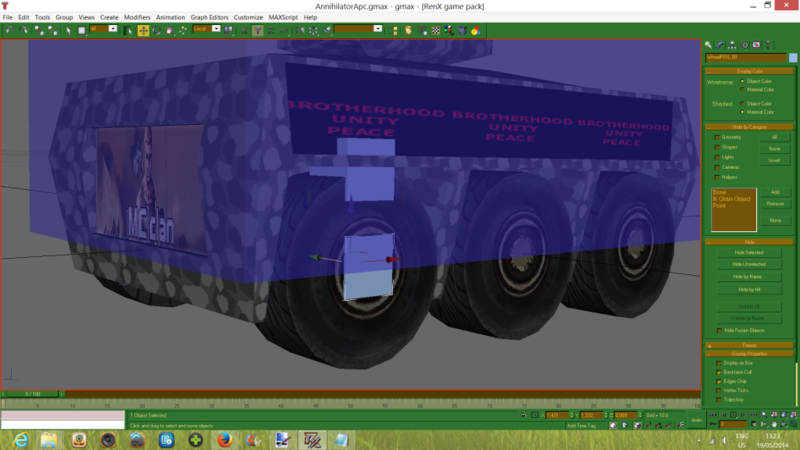 Only this time scroll down to the wheels as in the screenie below. These are the ones we want. Hit OK. You will get a pop-up message. Click No. Now select all xref objects again and click merge. Click OK in the next pop-up confirmation and then close the XRef window. Now zoom out. You will notice the bones are rather enormous. Move them closer to the center of the scene and resize them. 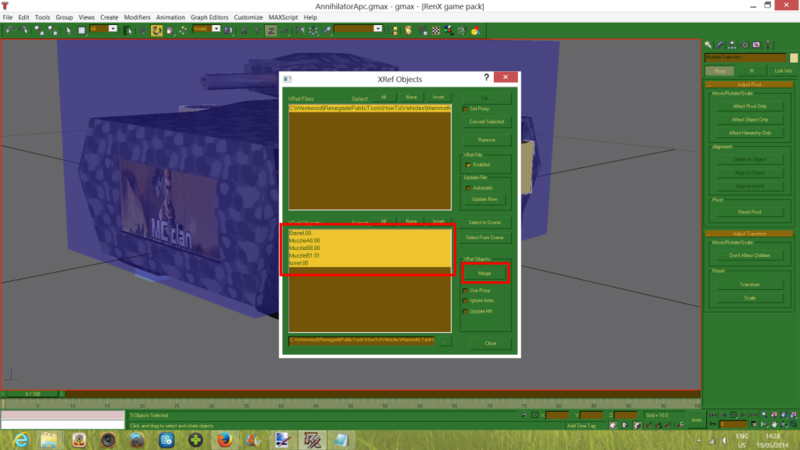 When you go to the modifier tab you will notice they are editable mesh meaning the only way to resize it on that tab is by dragging vertexes. We will do something a bit faster. Select all your wheel bones and click the scale and uniform scale tool. Click in the area between the three arrows, NOT on an arrow, and pull your mouse down to make them smaller (and move your mouse up to make them bigger, but they are too big, so do not do that here ^^). If you do it while clicking on an arrow it will only be scaled along that arrow's axis. We need to scale it with all three. As you can see they have been scaled down nicely. However, you might also notice we have only 4 pairs of bones. And my vehicle has 6 wheels. We are 2 pairs short. On my screenie I have already split up the left and right bones accordingly. Use the wheel models with R and L as reference. Now Select a pair on each side (a pair is wheel c and p bone) and hit clone. The default naming is fine as we will be renaming the wheelbones soon anyway. Hit Ok and drag your cloned bones away. Now we have to position the bones. Use your wheel geometry x and y co-ordinates to place them. You only have to have the wheel p bone selected (the bottom one) as the wheel c bone will move and rotate whenever the p bone does. As you can see the copied co-ordinate put the bone on the wrong side of the wheel. We will have to do the Y co-ordinate ourselves. Drag the bone along the Y arrow so that comes out just a bit at the wheel side. Note: the wheel P bone is the contact point with the ground, while the wheel C bone handles the wheel rotation (during driving). copy the value of the wheel itsself. Now that the wheel P bones are placed properly on this side. Let us look at the wheel c bones. These need to be in the center of you wheel. As you can see they almost are already. Once you have it in the middle copy paste the Y value to the other wheel c bones on this side. Now rotate the camera to the other side and do the other bones. You can re-use the z values of both bone types. Now copy the y value from one of the wheel P bones on the other side and put a minus in front (or remove it depending on which side you did first). Lastly copy paste the x values of the actual wheels again on this side. 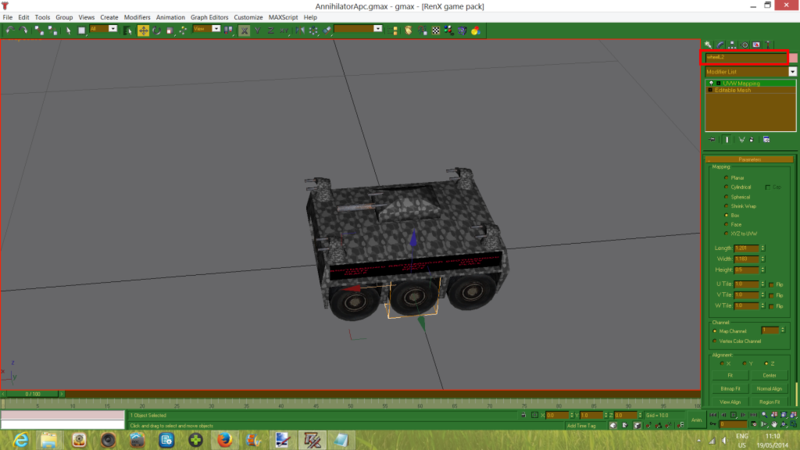 Next we will have to move the worldbox down a bit; as you can see the wheel c bones are not inside it right now. We will have to drag the worldbox down so that they are. The wheel P bones however have to stay outside it. 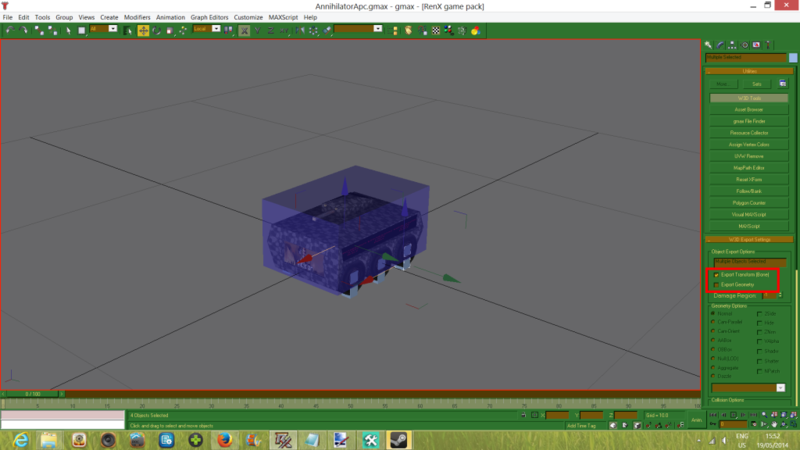 Just drag the worldbox down a little with the z arrow till the wheel c bones are inside. 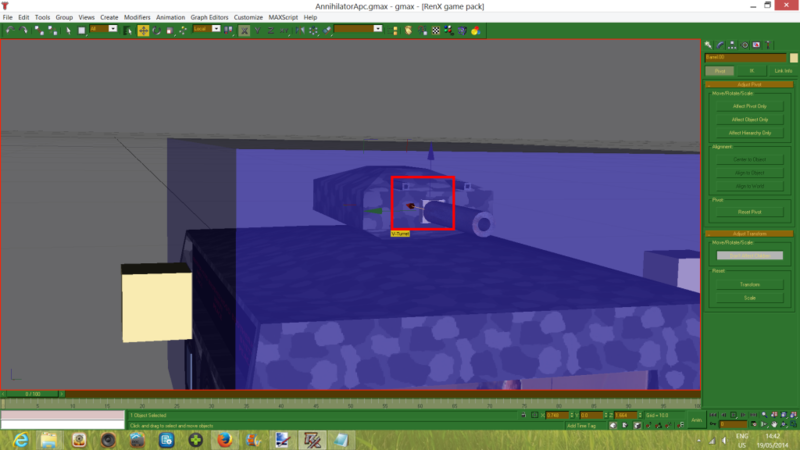 Now rotate your camera on top to see if the turret is still inside the worldbox. In my case it is not. 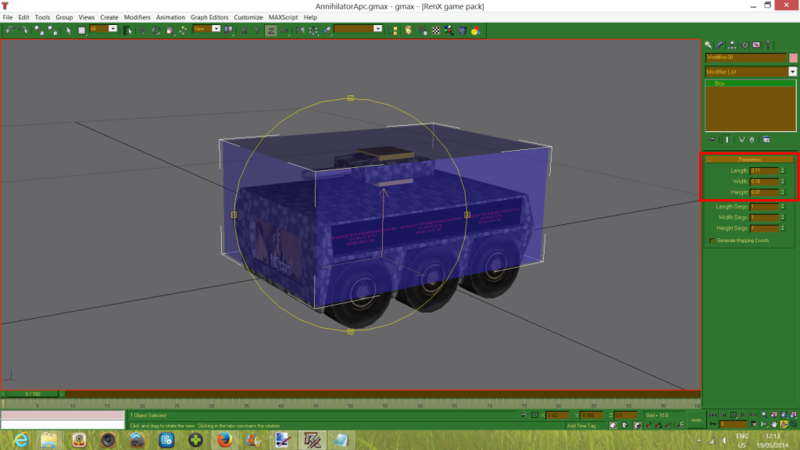 Go to the modifier tab and increase the height of the worldbox a bit so that it includes the turret once more. Now that our wheel bones are positioned correctly, we will now align them correctly. Select all wheel P bones and go to the hierarchy tab. Click affect Pivot Only and click align to world. Now unselect affect pivot only. Press 'h' and select all wheel C bones. These we cannot align as easy (at the click of a button), because they are NOT to be aligned to the world (the wheel C bones are the ONLY exception that I know of). Instead click the rotate tool and change the view to local. In the local view the wheel c bones their Z arrow should be pointing down. It is not doing so in my case. Position your mouse over the x arrow and rotate it by +90 degrees so that the Z arrow is pointing down. Keep the wheel c bones selected. The X arrow does need to face the same way as the world and the Y arrow has to face the opposite direction as the Y arrow of the world. Rotate the Z arrow by 180 and you should have this set up right now. Use the second screenie below as reference. In the local view the wheel c bones their Z arrow should be pointing sideways, and the Y arrow should be pointing upwards (and the x arrow forward). If your wheel P bone is rotated correctly than your wheel c bone should be in this position. If not, rotate each wheel so that they look like in the below screenie. -The turret bone which determines at which point the turret spins around. -The barrel bone which determines at which point the barrel is connected to your vehicle. -The Muzzle bone(s) which determine(s) the point(s) at which projectiles come out of your vehicle's barrels. You can have 1 or 2 muzzle A bones and 0, 1 or 2 muzzle B bones. 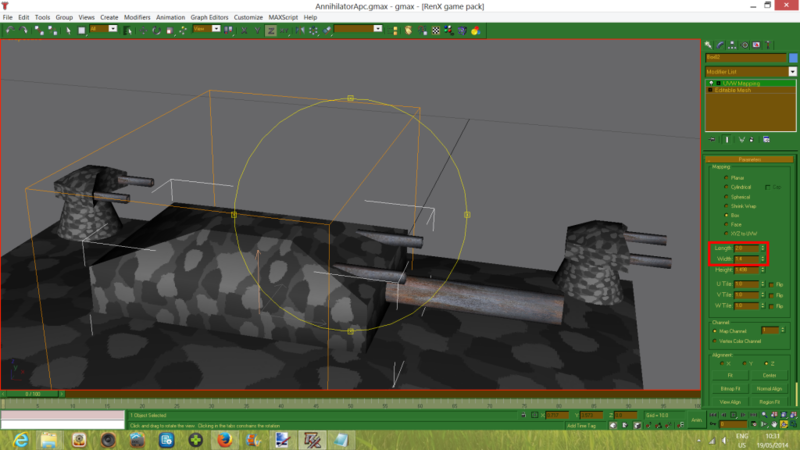 Muzzle A bones are where your vehicles` primary weapon comes out of the barrel (which is why you need a minimum of 1), muzzle b bones are where your vehicles secondary weapon comes out. Muzzle B bones can be omitted if you do not want your vehicle to have a secondary weapon. MuzzleA1.00 if your primary weapon has 2 barrels), MuzzleB0.00 & MuzzleB1.01 (since my secondary weapon has two barrels). Remember, hold down control to select multiple. Click ok when you have all selected. Select all bones again and click merge. Click OK on the confirmation message and close Xref again. Zoom out if you cant see all bones. Select your turret bone turret.00 and click on the scale tool. Shrink the turret bone and the barrel and muzzleA bones should also become smaller. Once they are small enough go to the the hierarchy tab. Keep the turret bone selected and click on Don't Affect Children. This will allow us to move the turret bone without moving the other two bones. Put the turret bone in the middle of your turret and keep the center of the bone on the edge of where the turret meets the chassis. 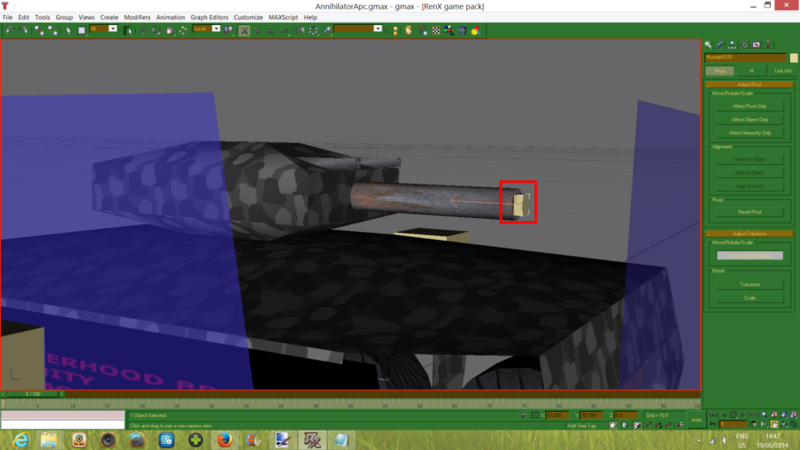 Next put the barrel bone at the point where the barrel meets the turret like on the screenie below. 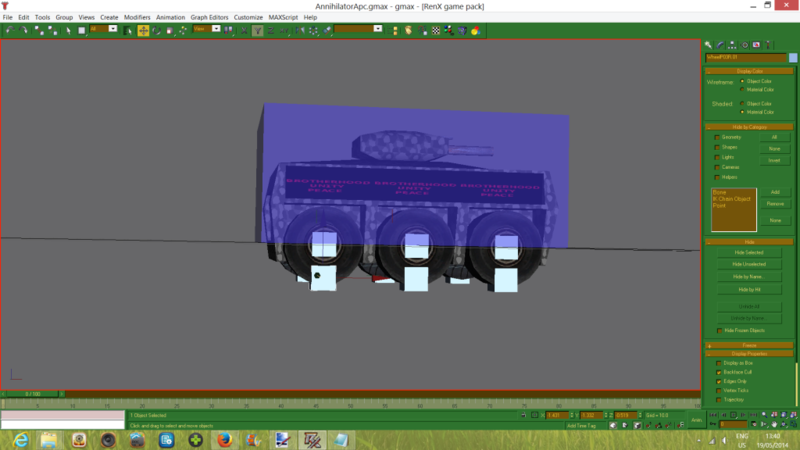 Now sink it into the turret so that you can not see it anymore. You might also have to sink v_barrels in a bit if does not touch the barrel bone. Next position your muzzleA bone at the edge of your barrel, half inside, half outside. Next select the muzzle B bone(s). These are not linked so you can unclick the don't affect children button. Select you muzzle b bones and shrink them with the scale tool. Position them so that they are also at the edge of the (fake) barrels. Now reselect all the bones we just positioned (turret, barrel, muzzle A, muzzle B. ). 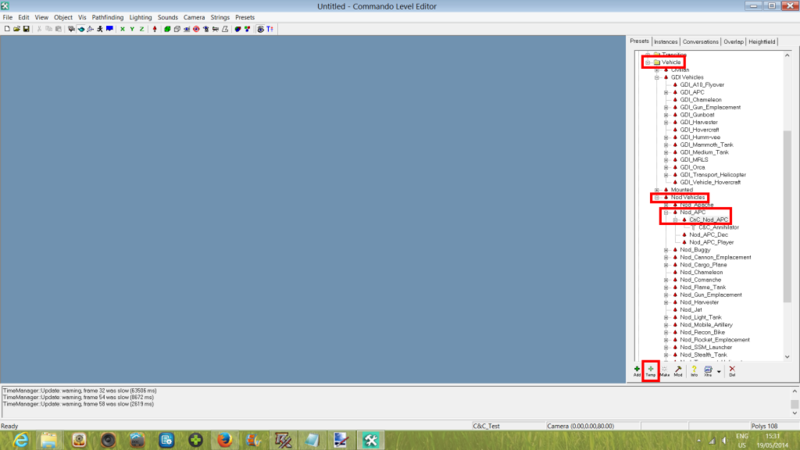 On the hierarchy tab click affect pivot only and click align to world again. 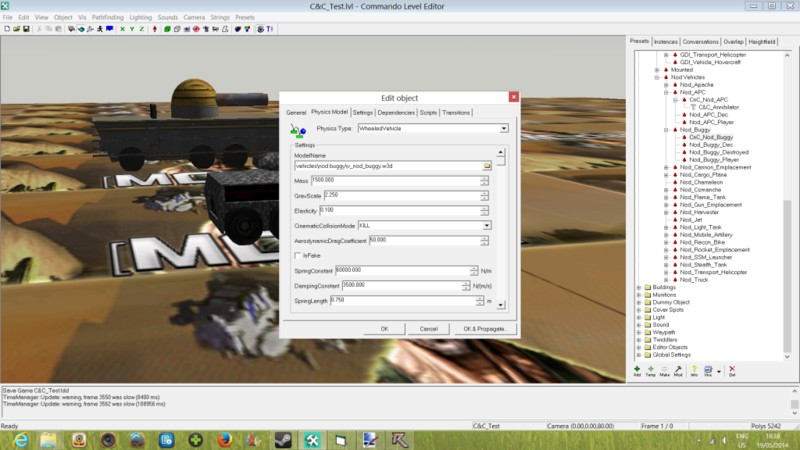 Then uncheck affect pivot only and click anywhere to deselect your bones. The below screenie is before clicking align to world. Now select your bones one by one by pressing 'h' and clicking on them. Delete the .00 and/or .01 off of all of them. Also do this for the worldbox. Save the wheel bones for last. When you are about to rename your wheel bones also cut of that .00, but also rename them right away. For example the wheel I have selected below is named wheelR5 but the bones it has are called WheelP03R.00 & WheelC03R.00. We will delete the .00 off the end as well as rename these to WheelP05R & WheelC05R (the wheel itsself is 'wheelR5' after all). Repeat this for all wheels. The last screenie below shows all wheel bones named properly. The R and L indicate Right and Left Track. Note: to change the name go to the modifier tab and edit the top box again like before. -We will put S for Steer on one wheel pair on both sides. Do not put this on more than 1 bone pair per side or your steering will be bugged. Also make sure that the bone pairs are of the front wheels. -E for Exert Engine force. Put this on all REAL wheels. -F for Fake. This flag here allows us to have 6 wheels (8 will probably also work) instead of 4. Put the F flag on 1 pair of wheel bones on both sides. There are only 4 pairs of real wheel bones allowed on a wheeled vehicle. The rest will have to be tagged fake. Use F ONLY on wheels you want to be fake. You can combine multiple flags. You could have a bone flagged with EFS for example. In my setup I will have the front wheel bones flagged with ES, the middle wheel bones with F since those are the ones I setup to be fake, and the rear ones I tag with just the E. Below screenie shows these names (ignore the hierarchy for now, I made this screenie after already linking everything). 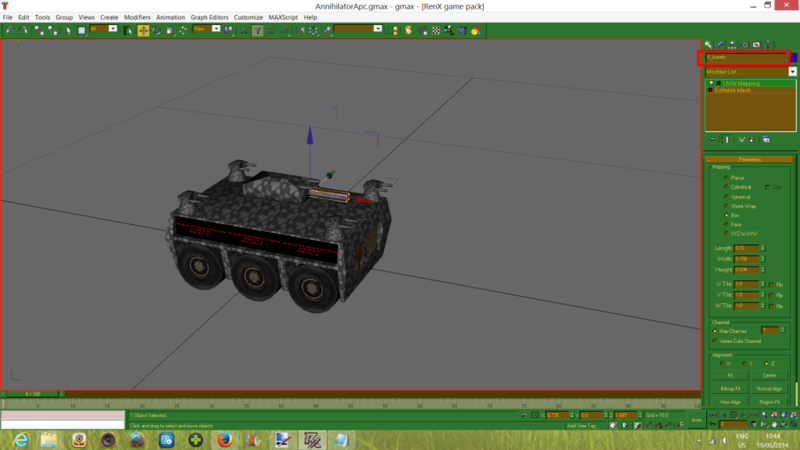 mine I will be basing it on the APC. 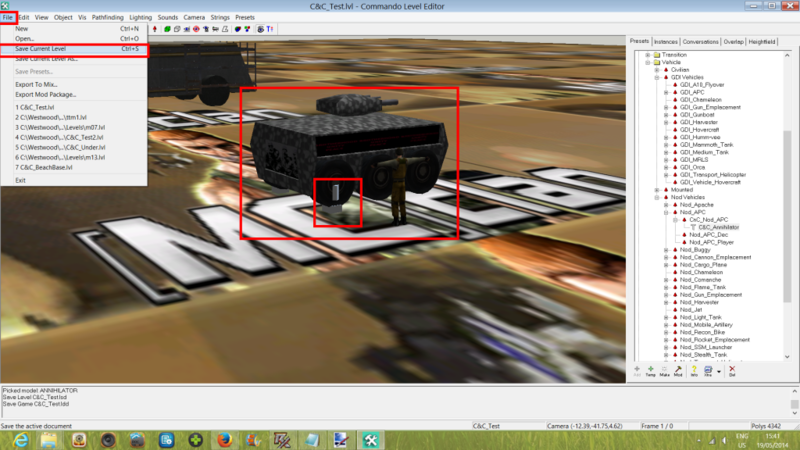 Just make sure you temp a vehicle with CnC_ in front of it, since that will already have the transition zones (= get in and out of vehicle zones) set up. We use temp because it will be a .mix map and it will also be serversided. Click mod on the new temp. 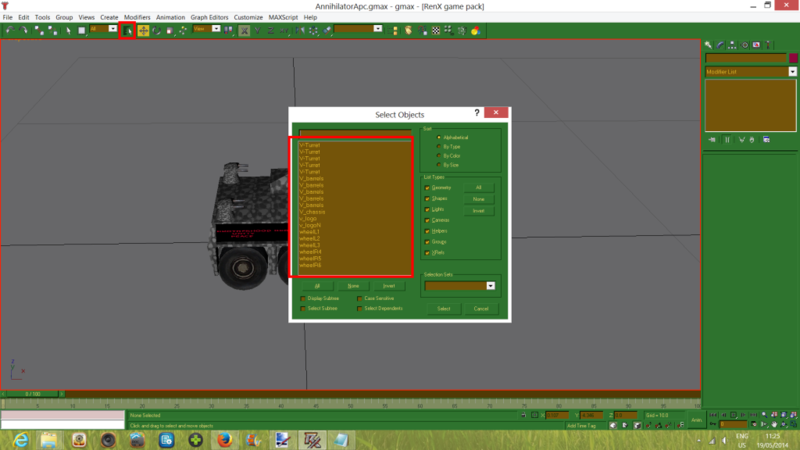 As you can see the physics tab stats differ quite a bit when it comes to trackedVehicle or WheeledVehicle. Click OK to finish your modifications to your temp. Now either load up a level if you have one already in your mod, or quickly temp some terrain and make it and then save it as a a level. 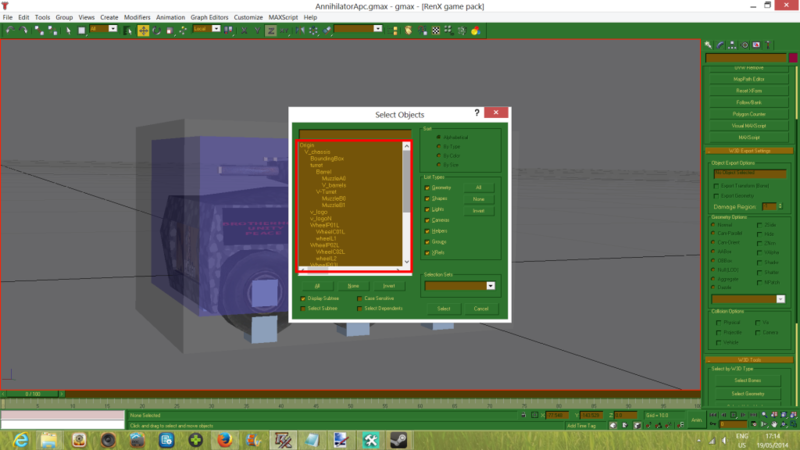 With your custom vehicle preset selected click make. You should now be seeing your vehicle. 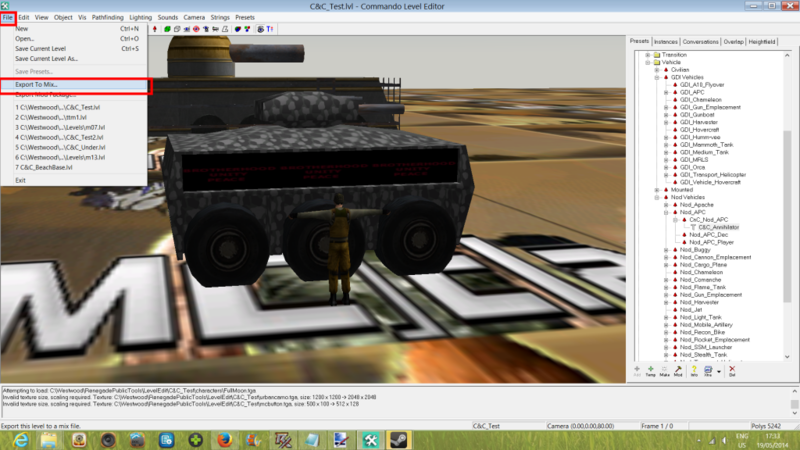 As you can see our vehicle is a tad smallish compared to the soldier spawner. Because we have not yet linked anything we can still rescale everything without messing anything up and without having to do Dont Affect Children. Also our rear wheel bones are showing up. 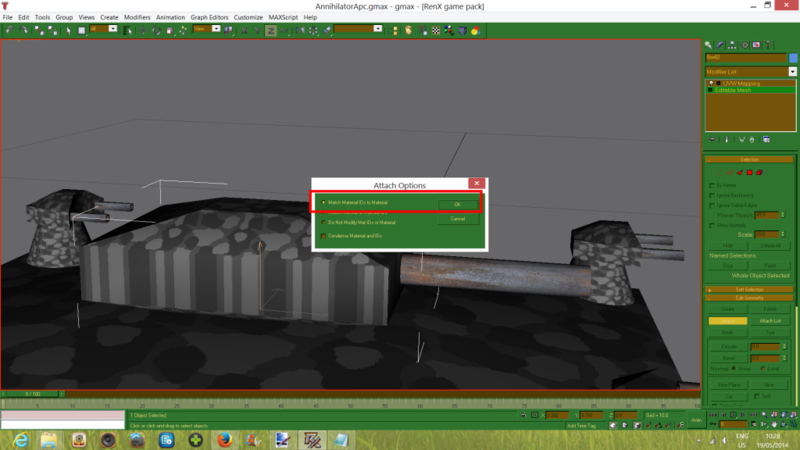 I forgot that cloning bones means you will have to set their w3d export settings manually. Let us do this first. hit h on your keyboard again. 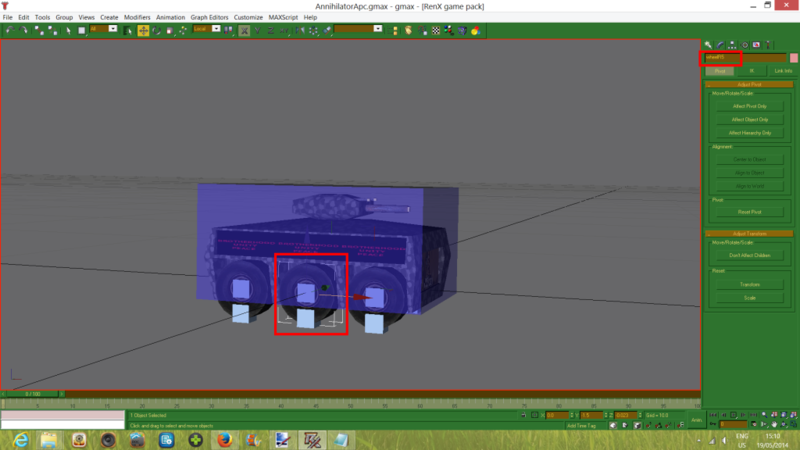 Select the rear bones (since I named them from front to back the rear ones are L3 and R6 for me). 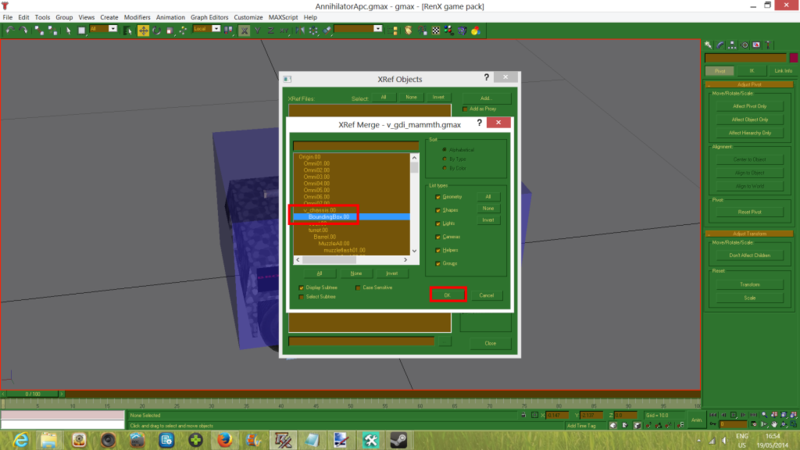 Go to the w3d settings again on the utilities tab and uncheck geometry. This will fix the bones being visible. 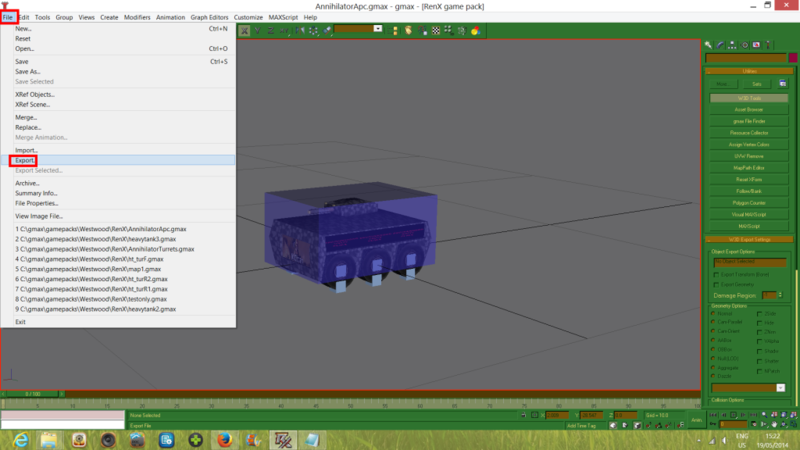 Now hit h again and select the origin bone and on the w3d setting check Export transform (bone). I checked all the bones we Xreffed and noticed that the origin did not have that setting enabled. The origin was the only one. No need to check the rest as I already have (unless you want to be thorough, in which case, knock yourself out :3). 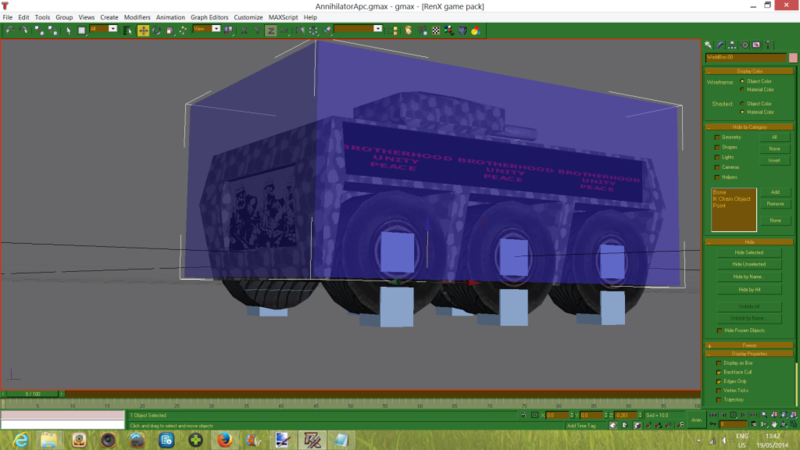 Now to rescale our model to make it a bit bigger (that is, if yours is too small also; if you like the size of your vehicle, skip this). 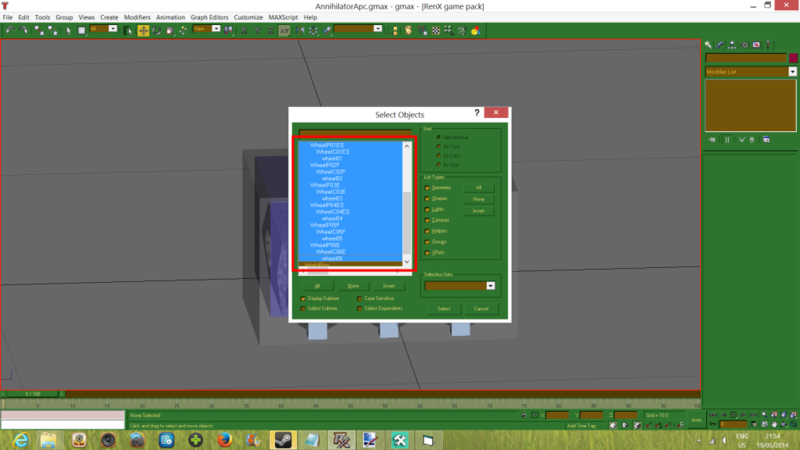 Select EVERYTHING in your scene. Use the scale tool and move your mouse up to make bigger. Everything will shift postition a bit, but will be the same scale in relation to each other as before (the wheels will not magically become bigger than the chassis, unless you forgot to select it). The only thing we need to move back now are turret and origin bones. 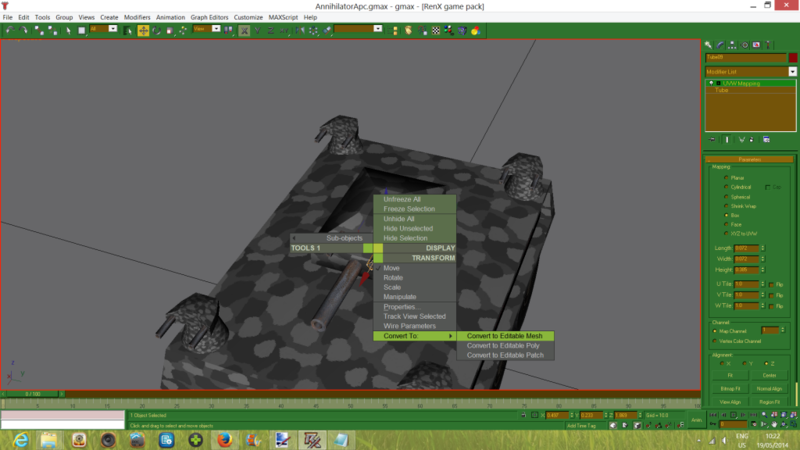 Use the hierarchy tab with don't affect children again to move the turret to x:0 and Y:0 (NOT Z). Reposition the origin to 0,0,0 (don't affect children is not necesary here). need to do this for LE to refresh the model. Below is how it looks now, which for me is big enough. 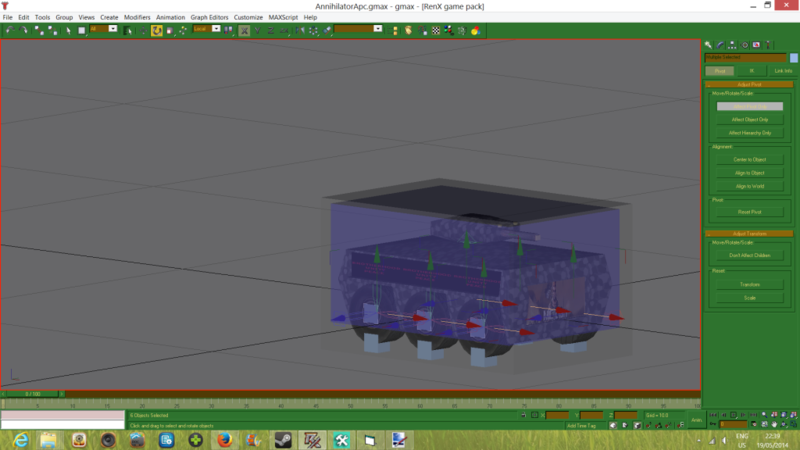 Now for another rather precise part. 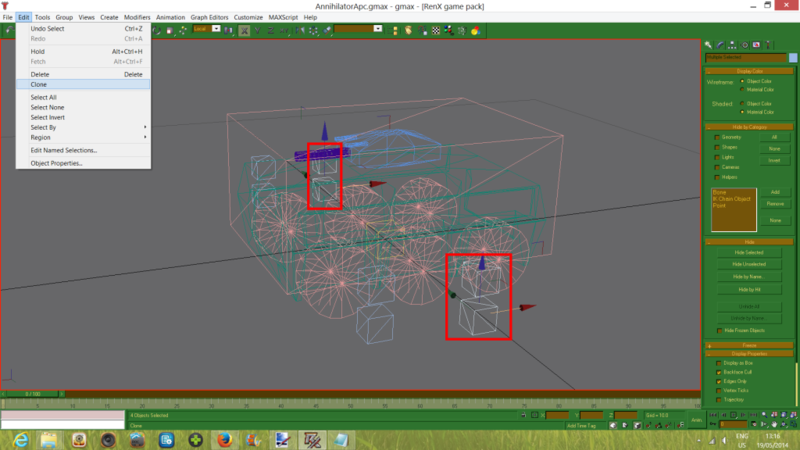 We have to link everything we have made so far in the proper way so that the hierarchy of the vehicle is properly setup. Press 'h'. Check the display subtree box at the bottom. -The Worldbox is linked to origin. -V_chassis is linked to origin. -Turret(bone)and your WheelP bones are linked to v_chassis. -Wheels (geometry) are linked to the WheelP bones. If TRACKED. -Wheels (geometry) are linked to the WheelC bones. If WHEELED. 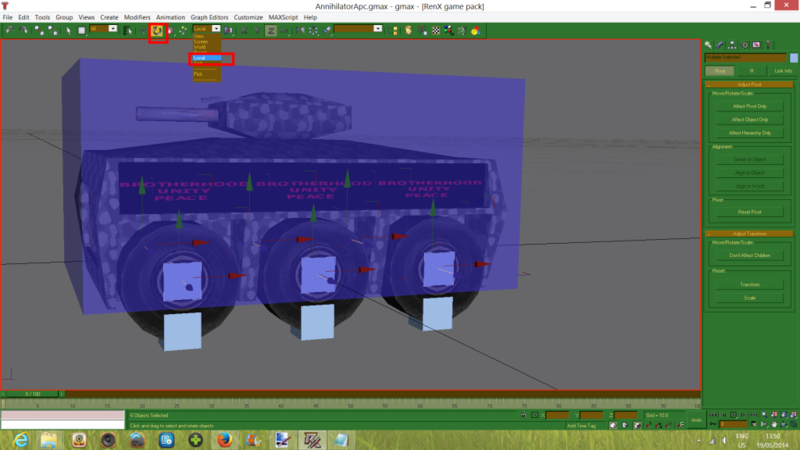 -Barrel and v_turret are linked to turret (bone). -MuzzleA0(bone) and v_barrels are linked to barrel(bone). 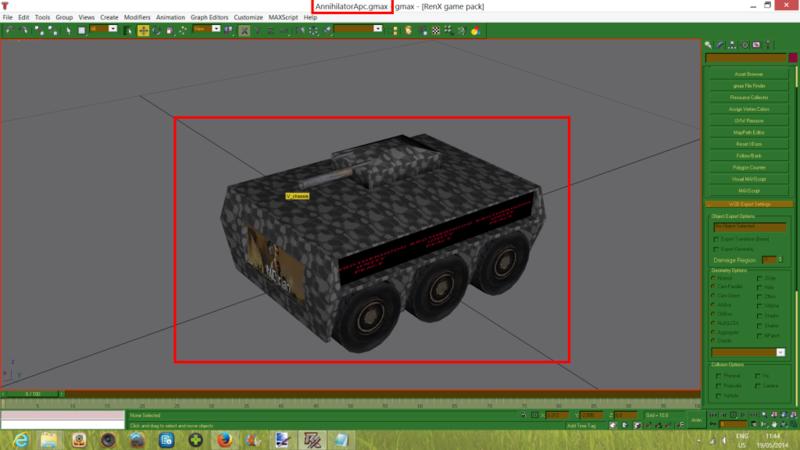 -MuzzleB1(bone) is linked to v_turret. -V_tread_R and WheelCR(bones) is/are linked to wheelPR(bones). -V_tread_L and WheelCL(bones) is/are linked to wheelPL(bones). To link things, select the child with 'h' (the one to be linked under the other object), click the "select and link" button and bring up 'h' again and select the parent (the object under which it will be linked). First select the worldbox (use 'h'). Click select and link in the toolbar. Bring up 'h' again. You'll notice it says link now where select used to be. Click it. The items are now linked but it will not show up properly in 'h' yet. Change to the select and move tool, the rotate tool, or the scale tool. Now bring up 'h' and you will see that they are now linked. Next link V_chassis to origin. 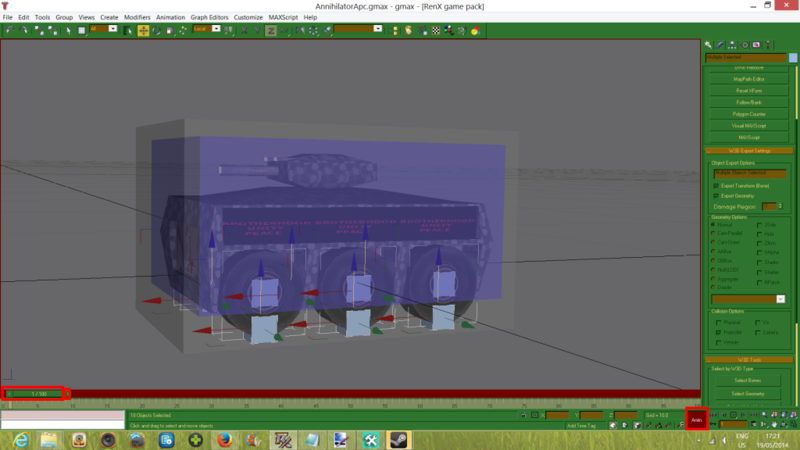 Then link turret to V_chassis (that which was linked to turret will stay that way and move accordingly). 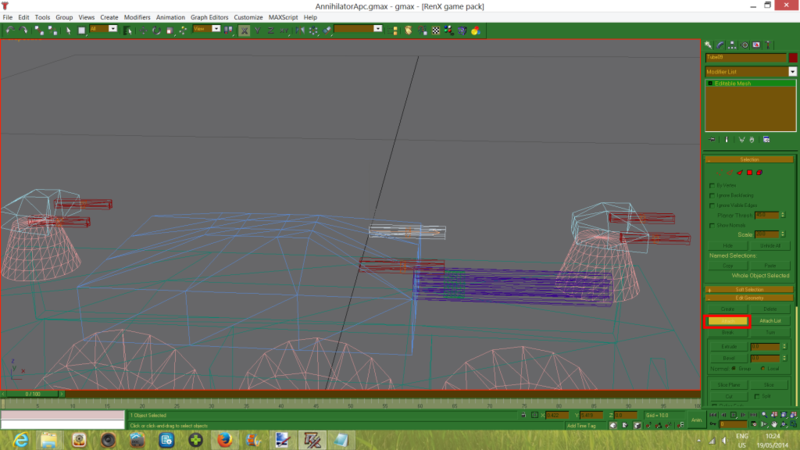 Next link all you WheelP bones to V_chassis one by one. Next link your wheel geometry to your wheelP bones. Next link your wheel geometry to your wheelC bones (or they will not spin ^^). After this link V-Turret (as Barrel is already linked) to turret. Next link V_barrels to barrel (MuzzleA0 already is). 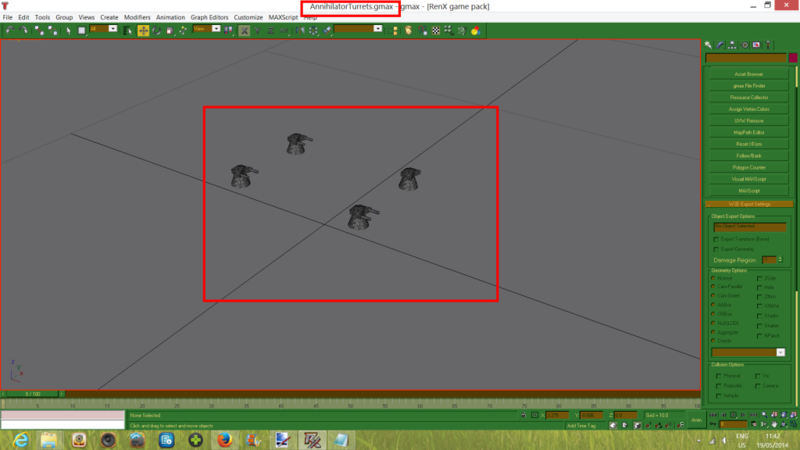 Now select your MuzzleB bones and link them to V-Turret one by one. That is it for everything that has to be there. Now to link our additional logo. 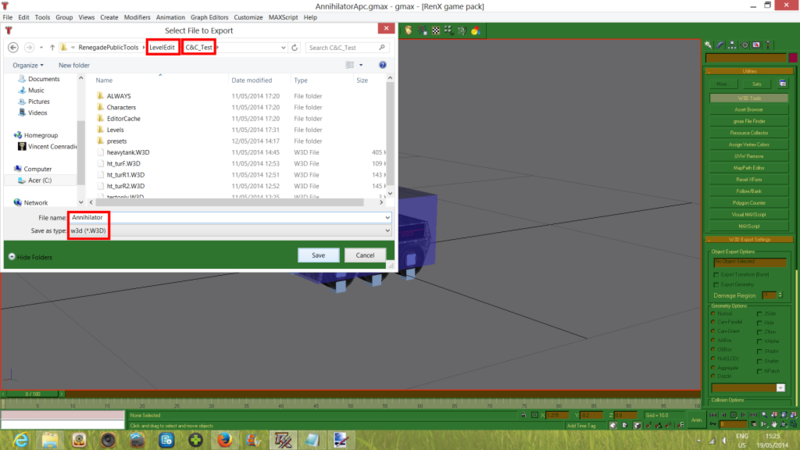 Select v_logo and v_logoN and link them to V_chassis one by one. values by a lot. Then Position it at 0,0,0. You will see that when you do that it is below your vehicle. 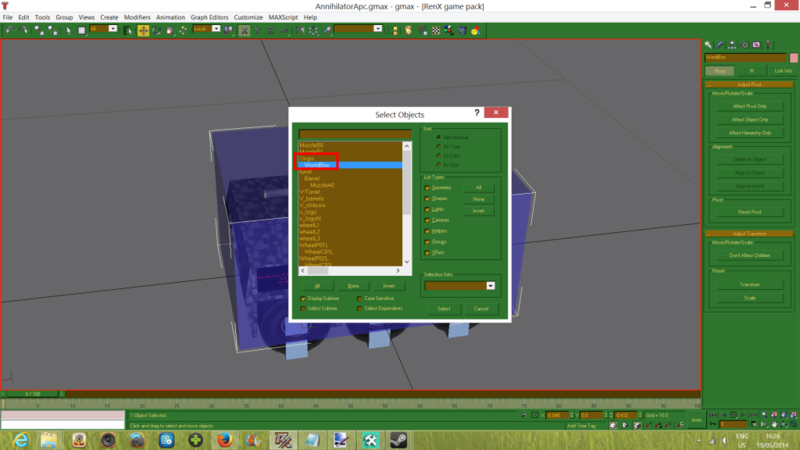 Go to hierarchy tab, click pivot only and click center to object. Click affect pivot only again to deselect and change the z value to 0 to position the box right. 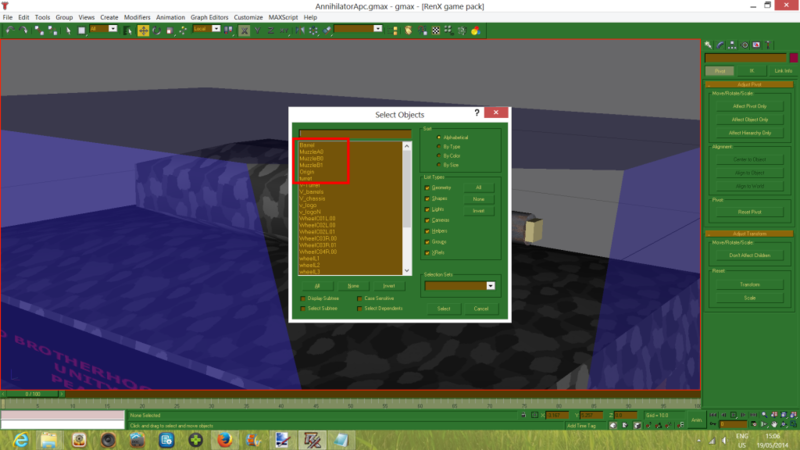 Next copy paste the values on the modifier tab of your worldbox into the boundingbox's and then center the pivot again. Now your Boundingbox will almost be the right size. Go to the modifer tab AGAIN. While here delete the .00 off the end of the name. Now resize the boundingbox bit by bit so that it is just marginally bigger than the world box on all sides but the bottom. On the bottom side make sure the WheelP bones are just INSIDE it. 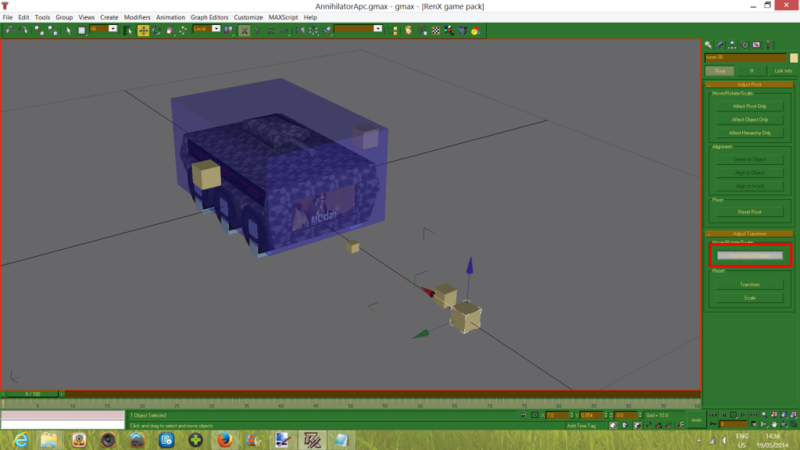 The boundingbox has to be bigger than the worldbox and will bind anything that is not in your worldbox to your vehicle. 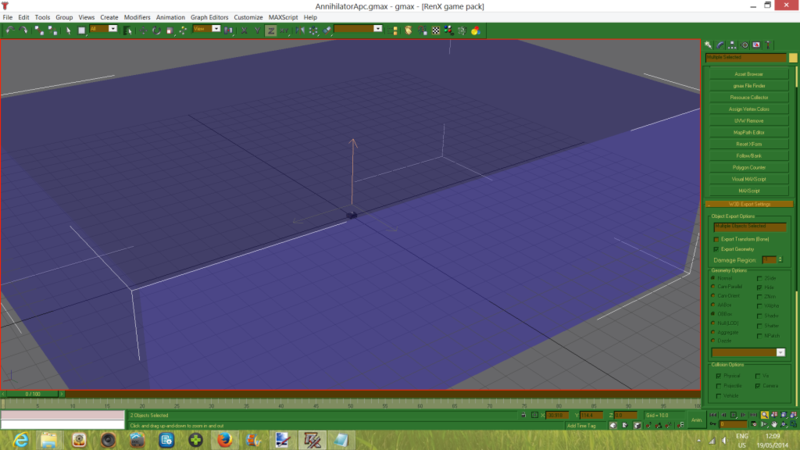 Last screenie below is the size and position I end up with. Now do one last center to object on the pivot. Next to link it. 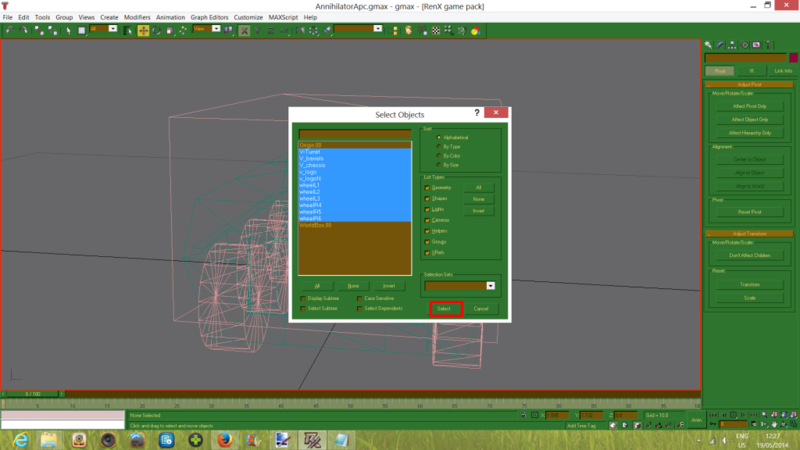 Click the boundingbox in 'h', click select and link and click the V_chassis. Click another tool and then hit 'h' again to see it. 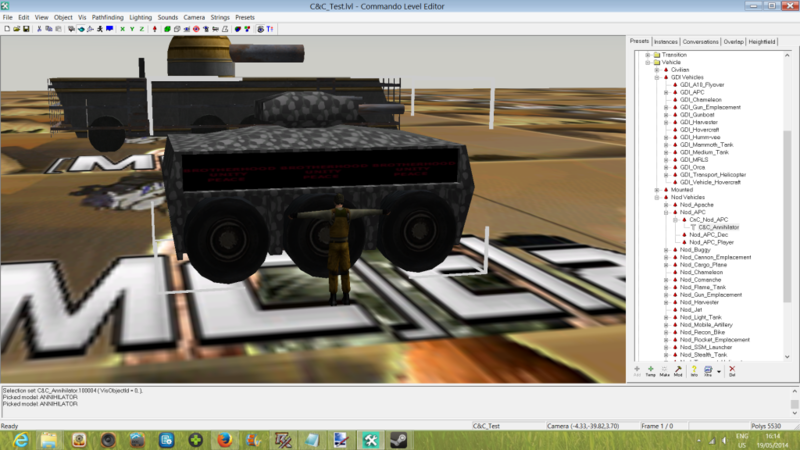 Below screenies show my end hierarchy with a TRACKED vehicle. Also, do not forget to change the boundingbox pivot to be aligned with the world (hierarchy tab). turn red along with the button. Now click the right arrow next to 0/100 once. It should say 1/100 now. This means we have 1 frame. Exactly what we need for the wheels to be moveable. Now drag the selection of all wheels and wheelbones up a bit and tuck them in their highest position, "as if your vehicle has just fallen off a skyscraper and landed directly on its wheels". As you can see I dragged my wheels up through the wheelcage a bit. I do not think that this matters, but if you wish to play it safe than pull it up as much as you can without going inside the chassis. When your wheel and wheelbones are in position click animate again to close the animation. Slide the animation frame bar from 0 to 1 and back and forth if you wish to see the difference. Put the slider on 0 again when done. We will bone the additional turrets in the next tutorial.